USA Trials-June '10: The improvement in conditioning and effort from Gray was on display during the U18 trials in Colorado Springs from our spring evaluation viewing at the Deep South Classic. Physically, Gray is an imposing figure who pursues rebounds throughout the key area. There were several instances we spotted Gray outrunning post defenders in transition. Although the ability to convert was inconsistent, the desire to make herself a transition option was clear. When regulated to the confines of the half-court game Gray's post movements were pre-arranged, not predicated on what the defense gives, but rather what she was comfortable executing. Nike Skills-May '10: Physical strength and explosiveness make her a top tier prospect. She attacks relentlessly and isn't hesitant to mix things up. Her skill set is rough around the edges and needs some refinement to maximize all the athleticism that's in place. The work she's put in is obvious but there's still more to be done. Her shot outside five feet and her ball handling are there but not effective on a consistent basis. Her game has continually advanced and there's no reason to believe that she won't continue to reach for that next level. Nike TOC-Dec. '09: Other than the outrageously tall, not many players simply turn the heads of college coaches simply on their appearance alone. Washington Prep (Calif.) junior forward Reshanda Gray is the kind of player who turns those heads and most often she's going to get a second look as well. While listed at 6-3 but more likely topping out an inch or so shorter, she has the physical cut and build that just screams athleticism. Her agility, speed and leaping ability live up to their visual billing and her strength exceeds all expectations. Add to that an active and energetic approach to the game and the sky is the limit. At this point her skills are sound but still lack the consistency to make her a lock for the top tier of recruits in the 2011 class. The fact that the skills are in place tells you it's just a matter of time before the potential becomes reality and the line of coaches at her door gets even longer than it already is. Cali Summer Games-July 09: Cal Sparks Gold forward Reshanda Gray, of Los Angeles, Calif., was a hot topic among college coaches packed into HAX to watch her team play. She's 6-3, athletic and can score double digits each game on put-backs alone with her lift and length. She shows sound shooting form as well, which sets the table for a versatile scoring threat down the road. She has the natural ability to be among the best in the class, but needs to show the consistency of the country's elite. 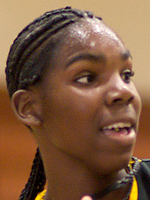 Spring Fling-May '09: Reshanda Gray of Washington High in Los Angeles is being pursued by the likes of Colorado, Long Beach State and Oregon State. That group likely will expand as she gains more exposure and, especially, builds her skillset. Right now, the 6-1 forward is tough, explosive, has fast-twitch muscles and is a flash down the court. Gray makes a lot of plays that others cannot, but that's mostly due to her athleticism and effort she's willing to put forth. Add in some more-refined fundamentals, as well as a bit more conditioning, and you'd have a potent mix. Selected to the USA Basketball U18 National Team, won gold at the FIBA Americas in June 2009 with U18 team, 2010 ... Los Angeles City player of the year, 2010. Pre-July '10 top schools: Arizona, Arizona State, Cal, Duke, Florida State, Louisville, Ohio State, Oregon, Pitt, Nebraska, Washington State.